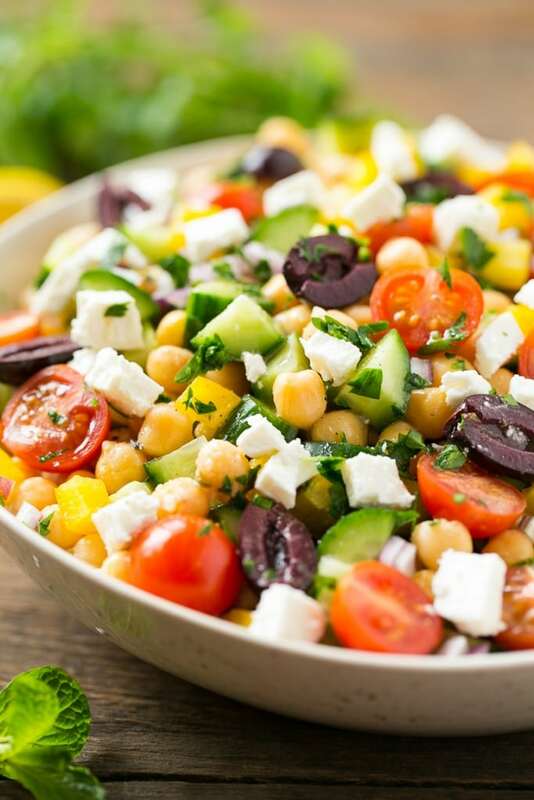 This recipe for chopped Greek salad is a variety of fresh vegetables with chickpeas, creamy feta cheese and olives, all tossed in a Greek lemon and herb vinaigrette. A quick and easy main course or side dish! So let me just say – this chopped Greek salad? Is my new favorite salad – I’ve made it three times in the past week, it’s just that good, and it makes the perfect lunch for me. You will not miss the lettuce in this one at all, I promise – the toppings are the best part of a salad anyhow! How do you make chopped greek salad? When I was dreaming up this chopped Greek salad I hadn’t envisioned the chickpeas as part of the mix, that was a last minute decision at the grocery store. The chickpeas MAKE this dish, I’m so glad I added them. 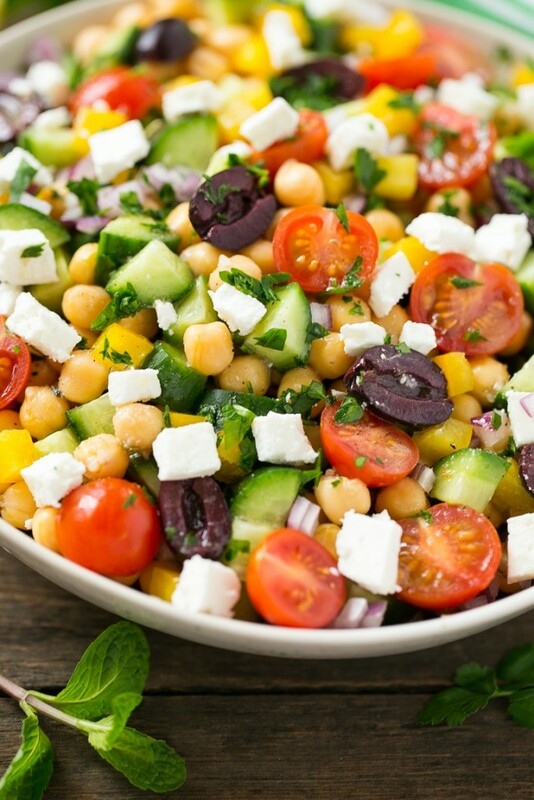 So you’ve got your chickpeas, cuumber, cherry tomatoes, bell pepper, red onion, kalamata olives and feta cheese, all tossed in a greek vinaigrette – salad perfection in my opinion! I prefer to use those little persian cucumbers here, although an english cucumber would also work well. My kids call this “rainbow salad” because of all the bright colors and that’s quite a fitting name. I used a yellow bell pepper to amp up the rainbow effect, but you can really use any colored bell pepper that’s available to you. I can’t wait to make this chopped Greek salad during the summer when all of the different varieties of tomatoes are in season. I am headed to the grocery store today and I will definitely be picking up another round of ingredients to make this salad, that’s how good it really is! 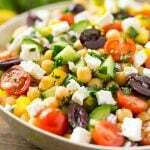 This recipe for chopped greek salad is a variety of fresh vegetables with chickpeas, creamy feta cheese and olives, all tossed in a greek lemon and herb vinaigrette. Combine all of the ingredients in a jar and shake vigorously to combine. Store in the refrigerator for up to one week. 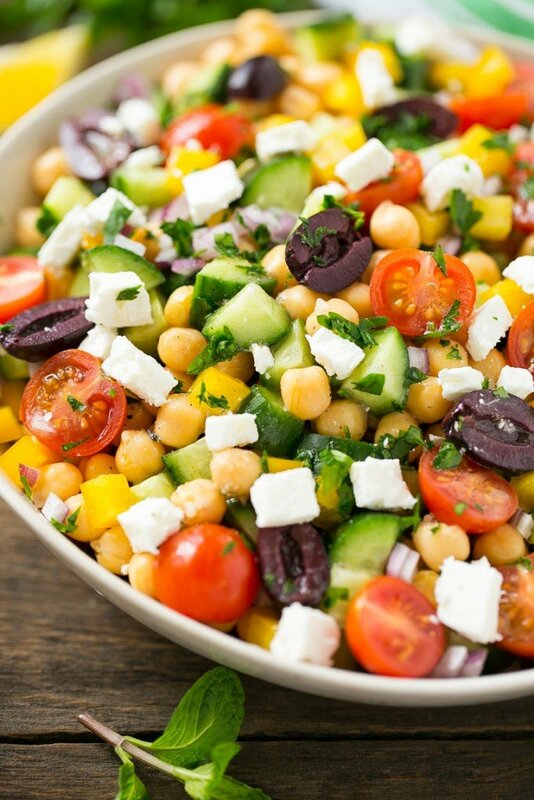 Place the cucumbers, chickpeas, bell pepper, cherry tomatoes, olives and onion in a large bowl, stir to combine. Add dressing to taste and toss to coat. Stir in parsley. Sprinkle the feta cheese over the top and serve.